Although strain wave, or “harmonic”, gearing can deliver high reduction ratios in a relatively small form factor, it is well known that the technology also impairs the dynamic performance of robot arms due to elastic deformation that occurs even well below the drive’s rated torque. The resulting design issues give rise to dramatic increases in robot weight and cost. This elastic deformation is characterized in terms of “torsional stiffness”. Torsional stiffness is a measure of the angular deflection of the drive as a function of output torque. 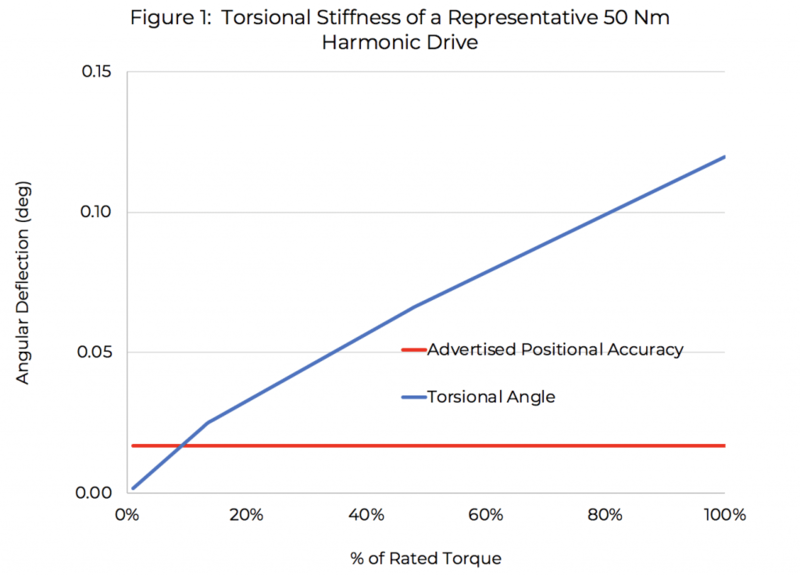 Figure 1, based on data published by one manufacturer, illustrates the phenomenon: At even a small fraction of the drive’s rated torque, the torsion angle greatly exceeds the positioning accuracy advertised for the product. Due to the high loads seen by the wave-generator and gear teeth, moderate operating torques can produce substantial transmission torsion. Due to manufacturing inaccuracies, harmonic drives exhibit a small but ubiquitous position error across the transmission. Since torque fluctuations produced by kinematic error can interact with the low stiffness of the transmission to excite resonances, high vibration amplitudes may be generated in some operating ranges. where K1 is the drive’s torsional stiffness, in Nm/rad, and J is the load moment of inertia, in kgm2. What is acceptable for resonance frequency depends on the application: slow-moving robots can tolerate low-frequency resonances, but faster applications require much higher resonances. A slow-moving welding robot may require only that the resonance be greater than a few Hz, whereas more dynamic robots can only tolerate resonances well above 15-20 Hz. As an example, a drive providing a rated torque of 10 Nm, selected in accordance with the manufacturer’s torque and lifetime specifications, may be entirely adequate for moving an positioning a certain payload with a moment of inertia of 5 kgm2, but the load would produce a drive resonance of only 5 Hz – suitable for only the slowest applications. 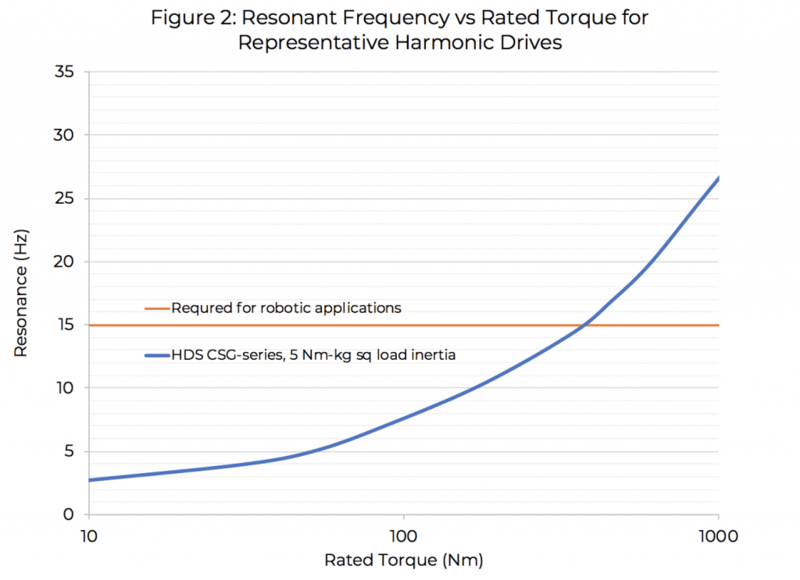 Referring to Figure 2, the designer would need to specify a harmonic drive with almost ten times the rated torque needed in order to support a faster-moving robot. The over-provisioning of torque described above results in much heavier gear drives being used in a robot than would otherwise be required, which further complicates the resonance issue. As is seen in Figure 3, the drive supporting the basic torque requirement in the above scenario weighs around 1 kg. The actual drive selected due to torsional stiffness concerns weighs seven times more. Because a robot uses multiple drives – up to 7 in some cases – this unwanted weight increase is not isolated: there is a rather distressing compounding of weight and otherwise unnecessary torque capacity. Each lower axis of the robot – each with its own dynamic behavior concerns – must support a much heavier load than might otherwise be needed. The lower axis motors are similarly affected since they too must support a higher output torque than would be otherwise needed. 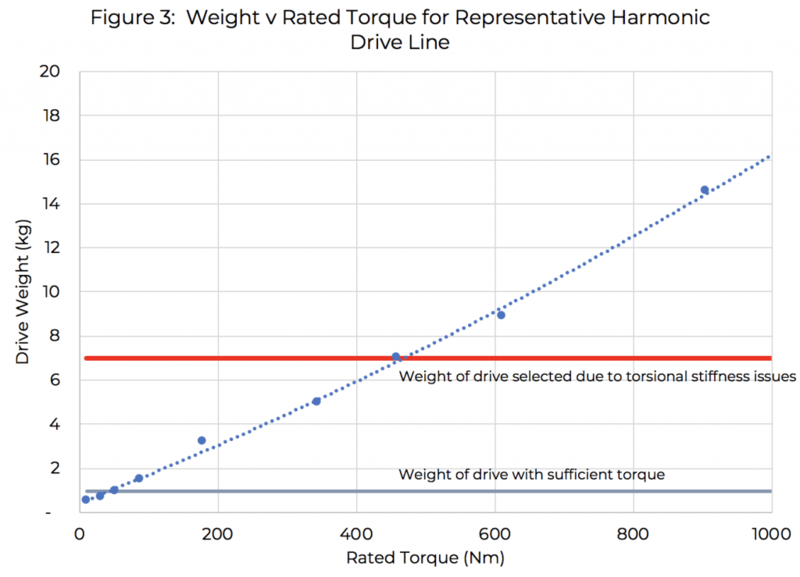 Based pricing data from a number of different harmonic drive manufacturers, the sensitivity of harmonic drive selling prices to torque rating ranges between 0.1 and 0.5 for the torque range we have been considering (i.e. the cost of a harmonic drive increases by 0.1% to 0.5% for every 1% increase in rated torque). This implies that the 10-fold increase in rated torque that results from torsional stiffness concerns could result in well over a doubling or tripling in drive unit costs. This, coupled with the need for additional output torque due to the weight increases discussed above, can lead to truly dramatic increases in overall robot system costs.